In January 1977, the French Situationist Guy Debord founded the Society for Strategic and Historical Games. The Society had an immediate goal: to produce Kriegspiel, a game of war that Debord had already designed in his head years before. The game was played by two opposing players on a game board of 500 squares arranged in rows of 20 by 25 squares. 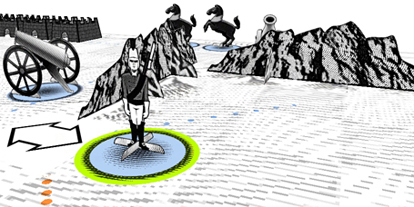 Now, developer RSG has recently released a computer edition of Kriegspiel. This version is an attempt to translate Debord’s game to the contemporary landscape without interfering with the simplicity and depth of the original creation. Essentially a board game played top-down or in 3D mode, Kriegspiel is very impressive, not only visually. Unfortunately, there is currently no single-player mode, no computer opponent – which makes it online only. Enjoy! Download it for Mac and PC here.